Fantastic news! This gigantic pub on Randlesown Road, London, SE6 3BT, which features on CAMRA's National Inventory of Historic Pub Interiors is to be restored thanks to a £3.8m Heritage Lottery Grant. 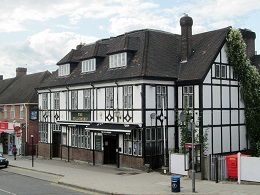 It was built in 1923-4 and is thought to be the first pub built for an inter-war London housing estate. This was at a time when the small back-street boozer was giving way to much larger premises which offered a wide range of community facilities. In this case, apart from the usual pub rooms we even have a large theatre. 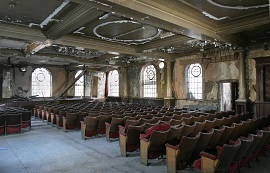 In later life it acted as a training base for boxer Henry Cooper ahead of his 1963 fight with Cassius Clay, and its theatre was graced by bands including Fleetwood Mac and John Mayall's Bluesbreakers. Since the 1980s the Fellowship has fallen into serious disrepair, with just one room open to the public, while Bellingham is today one of the UK's most deprived areas in the UK. Looks like it's going back to how it served the community 90 years ago. The pub is now owned by Phoenix Community Housing, which plans to use the lottery funding to carefully restore the existing bar while adding a cinema and live music/comedy venue to the rear of the building. Other plans include a café, bakery, microbrewery and artists' studios. The restoration is expected to create more than 70 jobs and many more training and volunteering opportunities in south Lewisham.